Definition of the ‘Brain Drain’. The brain drain problem refers to the situation where a country loses its best workers. For example, skilled workers in developing countries such as India or Pakistan may be attracted by better rates of pay and working conditions in developed countries, such as the US and Western Europe. In the past 25 years, there has been a substantial emigration of workers from Central and Eastern Europe – mostly Western Europe. Whilst this migration has benefits for the EU as a whole and the workers who emigrate, those countries who see large net outflows of (mostly young) skilled workers have seen significant externalities and costs. However, net emigration is not without benefits. Migrants send money back to their country and they can return with improved skills and knowledge of business. Less tax revenue from losing income tax. Young workers aged 25-60 make the biggest contribution to a nation’s finances because they pay income tax, but don’t receive pensions or education spending. Baltic countries with large net emigration are forecast to see a rise in dependency ratio – the number of pensioners to working age population. Decline in competitiveness. A shortage of skilled labour can push up wages faster than productivity. Remittances sent home can also cause appreciation in the exchange rate. Remittances can also lead to lower labour supply as those who receive remittances have less incentive to work for a low hourly wage. Polls of Bulgarian medical students show that 80-90% plan to emigrate after graduating. Reduces confidence in the economy; people aspire to leave rather than stay. Lower growth. According to the IMF – even allowing for the impact of remittances, net emigration has caused GDP to be lower than it would have been without net emigration. Although developing countries may lose their best workers, it is possible that there are several benefits for allowing migrants to leave and work elsewhere. Workers may gain more experience and from working in other countries. This knowledge can then be used when they return and set up business in their native countries. Migrant workers often send remittances – money back to their families in countries of origin. This can make a substantial contribution to the balance of payments and improving GDP. Remittances can enable investment and financial deepening. 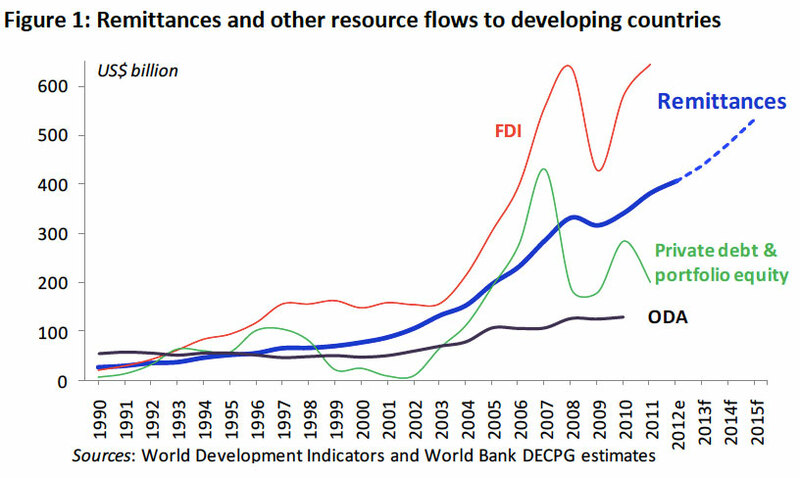 source: World Bank Migration and Development Brief, pdf. This shows that remittances from migrant workers are a substantial source of capital flows to developing economies. Migration is often short-term. Many workers who move to higher paid jobs often return after a few years. Rise in real wages living standards. Eastern European countries who have seen net emigration have also seen a rise in living standards and real wages since joining the European Union. The free movement of labour and capital isn’t one way. Multinationals have been keen to invest in Eastern Europe to take advantage of lower labour costs and growing markets. According to the Economist – the relative shortage of labour has caused firms to raise real wages. In the Baltic countrie, wages have been rising faster than productivity – which has forced firms to invest more in automation to remain competitive.